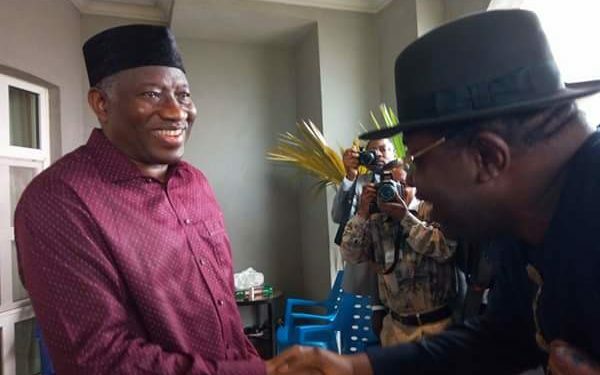 Former President Goodluck Jonathan on Wednesday doused speculations about a political rift between him and Governor Henry Seriake Dickson of Bayelsa State. The former President who disassociated himself rom the insinuations made in the media said that he was too close to Dickson to nurture political differences against him. A statement issued by the Chief Press Secretary to the governor, Francis Ottah Agbo, said Jonathan made the clarification during a condolence visit by Dickson in his Otuoke home to commiserate with him on the death of the Paramount Ruler of Otuoke Community, HRH King Lot Justin Ogiasa. Jonathan said, “Let me on behalf of the community thank you for making the visit, because of the relationship we have. You wanted to come immediately, but said it would be waste fir the governor to come when the date for the burial has not been announced. “For me politics is a very useless business; when I see the kind of things people write about me on the social media, I just laugh. For Bayelsa State, I feel sad because we are not many and we are not heterogeneous. It is a state that we also know ourselves. “I have no reason to say that I am competing with the governor; by the grace of God, I became Deputy Governor, Governor and President. There is no way I can sit anywhere and plan anything against Bayelsa state or the governor. “When I was dreaming of becoming Governor, Dickson was among the few in the meetings we were holding. He was not in the Peoples Democratic Party (PDP), but he agreed to help it. He didn’t want to join the PDP, but I virtually forced him. The Governor who led a high-powered state delegation for the condolence said he was part of the Ogiasa family and by extension, the Otuoke community of Ogbia Local Government Area. “We are here in full force as we have always done to commiserate with you, my elder brother, leader and the Ogiasa family in this hour of bereavement. We pray God to grant the Ogiasa eternal repose”, Dickson said. While dispelling rumour of any rift with the former president, the governor said in and out of office, Jonathan would continue to remain his leader, having come a long way with him. He therefore called on those who want to cause imaginary differences between him and Jonathan to sink their plans. “Both of us have come a long way. My personal political story cannot be complete without talking about my elder brother, Jonathan. He also knows that I made little contribution that is recorded in the political chapter of his life.”, the governor emphasised. Governor Dickson said both he and Jonathan were not running for any office and wondered why “political jobbers” were bent on destroying their good relationship.